This is a wonderful, three bedroom apartment in Barcelona, situated close to the home of FC Barcelona: the Camp Nou stadium and the famous shopping street Carrer de Sants. Ideal for families and groups of friends visiting the city, to watch the world famous FC Barcelona play. This apartment can accommodate up to and is in a great location, just outside the city centre but still within walking distance from some of the Catalan capital´s top sights. It is also very close to Sants train station and is just a few metro stops from Plaça Espanya. This area is also within close proximity to the prestigious Dexeus Clinic, the university area and the Les Corts neighbourhood, where you will find a number of shopping centres including El Corte Ingles, L’Illa Diagonal and Pedralbes. The apartment has a mix of modern and traditional styles. It is recently refurbished. newly decorated and has 75 square meters. There are 3 bedrooms in total, one with double bed, bedside tables and a wardrobe, one with 2 bunk beds and the other with 2 single beds, a bedside table and a wardrobe. Please note that two of the single beds make a bunk bed, and the other two are made up of a single bed and a pull out single bed underneath. Ideally located just outside of this apartment you will find a taxi rank. Sants Train Station is just one stop away, allowing you to reach the whole of Barcelona in a matter of minutes. 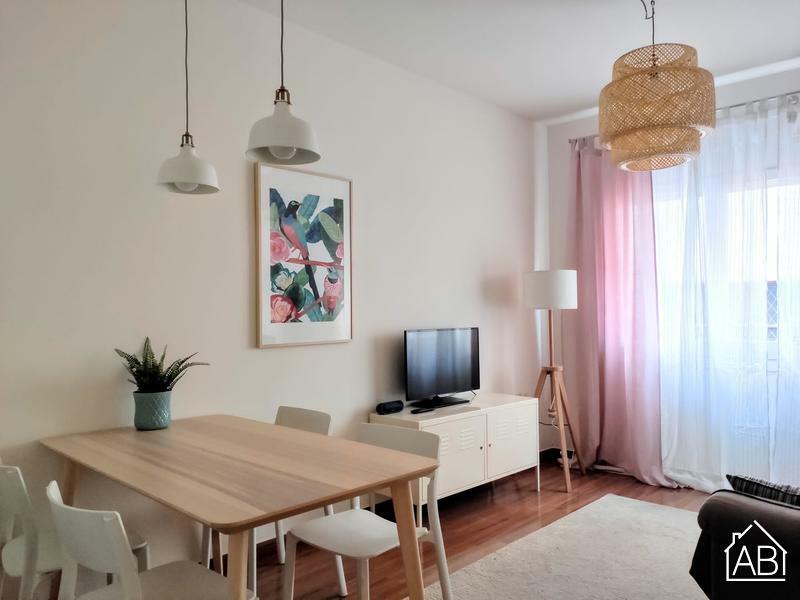 If you’re visiting Barcelona for business, this apartment is just situated 10 minutes by bus from the exhibition centre Fira de Barcelona 2 and the new City of Justice. The apartment has one bathroom with a walk-in shower. The living room is cozy and comfortable, has a large sofa, a coffee table, TV and a table that welcomes 6 people. This apartment is equipped with many great amenities including a refrigerator, a washing machine, an iron and ironing board, digital and satellite TV, a hair dryer, a toaster and a microwave. With central heating, air-conditioning and an Internet connection, you´ll feel right at home in this lovely apartment.